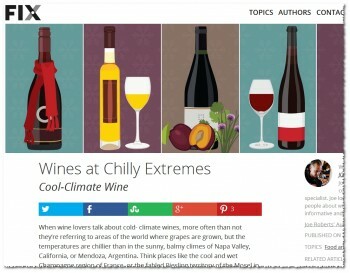 Last week, my latest for Fix.com was published, entitled Wines at Chilly Extremes. Just in time for Winter, which in my neck of the woods has been mild enough in general to make me want to instantly slap global warning deniers. The article is an alternate take on the “cool climate wines” theme, in which we highlight not grape varieties grown for fine wine in cooler regions, but the wine world’s more extreme cooler regions themselves. The result is some trivia-worthy tidbits on areas such as the Nahe, the Niagara Peninsula, and Norway, all brought to life in super-accessible Technicolor graphic style by the Fix.com design wizards. 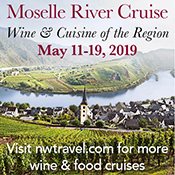 This time, some specific (and Pinot-centric) wine selections are also mentioned as examples from the highlighted regions: Kim Crawford Pinot Noir, Bodega Chacra ‘Barda’ Pinot Noir, Inniskillin Vidal Icewine, Nelles Spätburgunder, and the Lerkekåsa Solaris (and no, I’ve not had it or visited… yet…). You can head on over to Fix.com for the full-monty, and/or give your eyes an infographic feast via the embedded goodness below (more of my Fix.com work can be found here).